Her Unexpected Homecoming Has Conjured Up Memories and Images She Longed to Forget. Coming home to Kansas after years of being away, Macey finds herself beginning to unravel on the inside. She came simply to bury her father, then return immediately to her big-city career. The past would have to remain where it was–behind her, deeply buried. But once she arrives again in the old farmhouse, a roiling current of memories carries her back to the reasons she left in the first place. 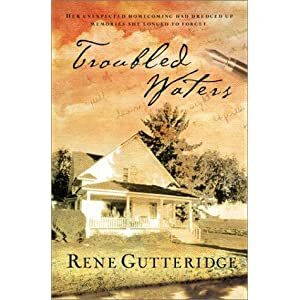 I really enjoyed this novel by Rene Gutteridge. I haven’t read her first novel, Ghost Writer, yet but I will certainly keep my eyes open for an opportunity to do so in the future! The characters are well developed and the plot moves along smoothly and the story is compelling enough that I was eager to grab a few pages here and there throughout the day. The love story was a little weak as was the passion between the two characters. More detail could be given to the development of their romance so that it was more believable. I thought the willingness of the twins to invite Macey into their lives to be a bit rushed as well. However, it was an enjoyable read and I would definitely recommend this book to my girl friends.